WonderWink--Compliments You Can Count On! These are just a few of the compliments WonderWink scrubs get from customers. And with so many choices to fit your personal style, you can expect to keep getting compliments, too. Here's why. With great choices like the High Performance Neo Boat Neck Top in the WonderWink HP collection; the crisp, Mock Wrap bodice of the Golf Lady Fit Mock Wrap Top in the WonderWink Origins collection; and the shapely, athletic look of the WonderWink FFX Sport Mock Wrap Top from the WonderWink FFX Sport collection, you'll be sure to find wink scrubs that fit your shape and style. 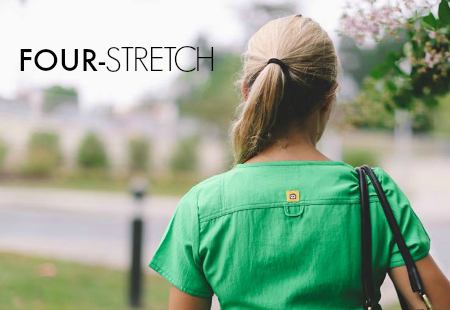 If you want pants that feel as good as your yoga pants but stand up to the rigors of the healthcare field, you'll love the cotton/polyester/spandex blend of the Grace Flare Leg Pant from the WonderFLEX collection or the fold-over waistband of the Four-Stretch Knit Waist Flare Leg Pant from the Four-Stretch collection. Or, you could even take your wink look to the next level with the smooth lines of the poly/rayon/spandex fabric blend of the Madison Pant from the WonderWink NEXT collection. 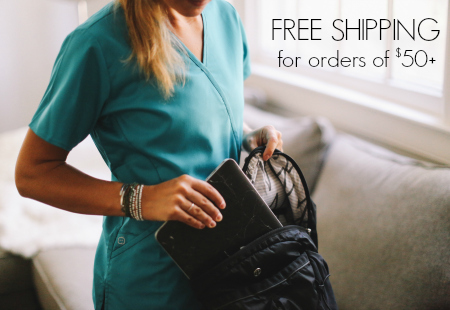 Not everyone is a cookie cutter shape, so WonderWink has the scrubs to fit all your curves and character. You need to feel good in your clothes, especially when you're at work, so you need choices above and beyond the usual small, medium and large mindset. Whether you're large and in charge, round and upward-bound, tall or small, WonderWink can help you wear it well. 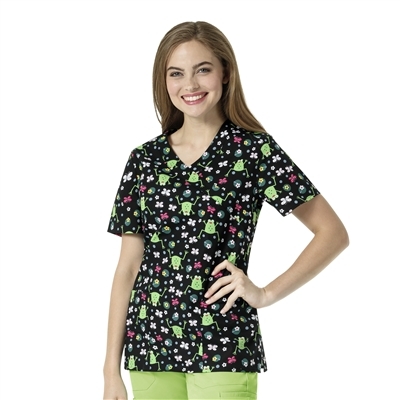 With the bold, vivacious and flirty fit of the WonderWink PLUS collection, you can look and feel good in scrubs that fit your fabulous curves. WonderWink PLUS offers a true 1X size all the way up to 5X for a flattering fit. Flare Leg Tummy Panel Pants give you the control and look you want, while the Curved V-Neck Top completes this curvaceous collection. Needing a petite fit with a big attitude or expecting a bundle of joy? WonderWink has you covered there, too. Petite fits for pants from XXS and up are available in many of the WonderWink collections. If you're expecting to expand for just a little while (say, nine months or so) check out the Maternity collection for a fit that grows with you and your baby bump. 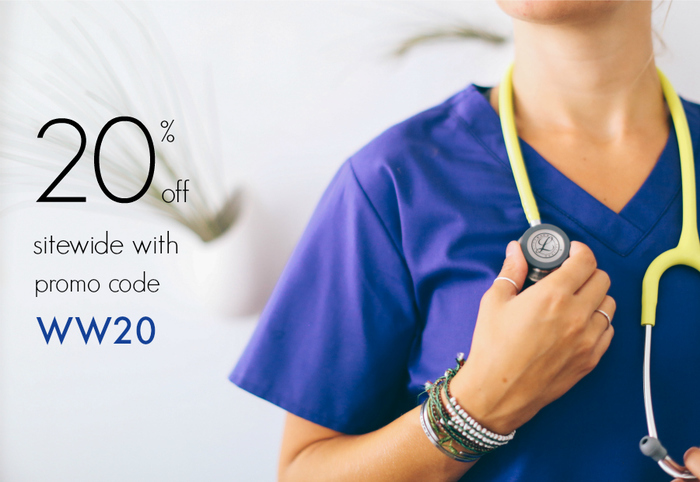 It's not just your WonderWink scrubs that will be the envy of all your coworkers, but lab coats and jackets in coordinating styles and colors, too. The choices never end with a variety of snap-front and zip-fronts for jackets and lab coats with plenty of pockets for everything you need to carry. Check out the selection of WonderWORK choices and take a look at the Carhartt camo, too. Don't forget those scrub caps, either. There are lots of colors to choose from. And, you can even sport your WonderWink style at lunch time, too, with the new yellow WonderWink Lunch Tote! Because we know you're all that and a bag of, well, you know! By now you can see that WonderWink isn't just a one-dimensional answer to your outerwear needs, but it can pile on the style underneath your scrubs, too! Hospitals and healthcare facilities can get cold, even when you're running from room to room on your shift. So, WonderWink offers layers of comfort and warmth to keep you moving ahead. Fabric choices come in Nylon and Rayon Spandex blends and 100-percent cotton. Check out all the stripes, adorable prints, and solid colors. With all these choices, it's no wonder that WonderWink's manufacturer gets compliments, too. As the original WonderWink Scrubs e-commerce website, WonderWink Scrub Shop is proud to carry quality apparel from the award-winning CID Resources. Even though CID Resources doesn't sell apparel directly online, we congratulate them for winning many prestigious awards, including the Uniform Retailers Association Best Customer Service Department, Manufacturer of the Year and Best Inside Customer Service Representative for three years running. We believe in complementing our customers as much as they complement us. So, you can believe it when they say: "WonderWink's slogan is definitely on point and so true! When you wear WonderWink, expect compliments!"